Ireland’s Citizens’ Assembly on how the State can make Ireland a leader in tackling climate change is failing in its duty to represent all viable technologies, including nuclear energy, as it is only allowing argument supporting renewable technologies. As a result, the process is not only flawed but it is doomed to fail as there is no credible path to success in tackling climate change – let alone lead in it – that deliberately excludes proven clean technologies. The Irish government declared Climate Change to be one of the most important long-term challenges facing us and effective action is needed now that we know that climate damage is happening quicker than we thought. 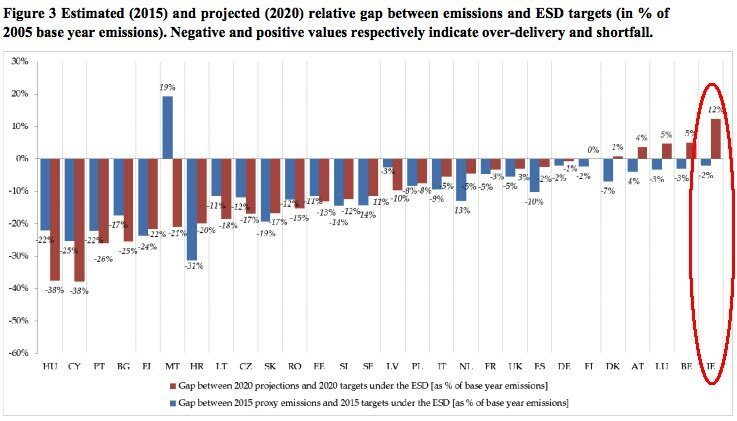 Ireland is by far the worst EU performer at meeting our climate targets, as can be seen from this official EU graph showing we are projected to exceed our 2020 emissions targets by 12%. During this period, we have had Ministers for the Environment from a variety of political parties (Fianna Fáil, Greens, Fine Gael, Labour and the Independent Alliance) tackle the issue earnestly – and with endeavour – but with limited success. That is not to belittle the many successful initiatives that most people are aware of. Ireland now has the highest fraction of electricity from wind turbines per person of any European nation. We changed our motor tax scheme and now drive much more efficient vehicles. Our waste collection is streamed and there is a good degree of recycling carried out by most people in the State. Many other, less well-known, initiatives are also underway. There is a state-of-the-art marine power testing facility on our west coast. Our electricity grid operator, EirGrid, has made huge changes to how our system operates to allow intermittent wind power reach global record-breaking levels. Building regulations are moving slowly towards achieving near-zero emissions standards. And there are a number of energy efficiency schemes, some grant-aided, operating effectively throughout the country. 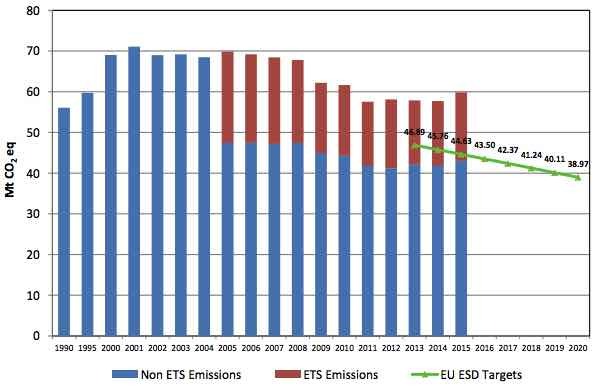 Yet, our emissions still rise as our growth in energy use outpaces the efficiency gains being made. Although Ireland will certainly miss our 2020 EU climate-related targets, and we are likely to miss those for 2030, we have set ourselves very ambitious targets for 2050. These aim at reducing emissions by at least 80% – and preferably by 95% – below 1990 levels by 2050. This will require fundamental societal change at every level in Irish society if the targets are to stand any chance of being met. In the case of issues where expert views are contested (i.e. where experts can make credible arguments that directly conflict with one another,) the Expert Advisory Group will ensure that both sides of the argument will be represented. Nuclear power is clearly one issue where expert views are contested and these different views are outlined in the Energy Green Paper from 2014, the last Government paper to address nuclear power’s potential for Ireland. [The subsequent Energy White Paper essentially ignored the issue, as in Clause 166: “Nuclear power generation in Ireland is currently prohibited by legislation“]. The Green Paper argued against nuclear power on the basis of cost and size – arguments that are strongly contested. For example, EirGrid published a study that showed that there was no means of supplying electricity in Ireland cheaper than using even a large nuclear plant. Regarding size, the Green Paper itself accepted that smaller reactors could be accommodated on the Irish grid (p 49). As it is clear that there are credible arguments in favour of nuclear power, there is an onus on the advisory group to ensure that both sides of the argument are represented. That this has not happened appears to be a significant breach of the Terms of Reference for the Advisory Group, and is a matter that should be rectified without delay. Fortunately, this is a relatively straight forward matter to rectify. What is more significant is that even the Citizens’ Assembly advisory group do not appear to understand the extent of the challenge that is facing us in effectively tackling climate change. 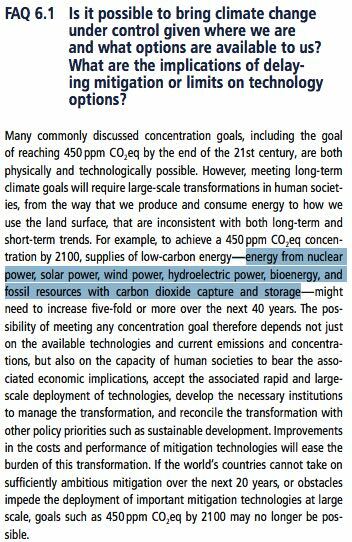 Worse, they appear to believe that we could lead in this area merely by reinforcing current energy policy. Certainly, we need to engage with the Citizens to ensure that society takes all the small but important steps needed to tackle climate change, not only through the Citizens’ Assembly but through the planned National Dialogue on Climate Action. But we also need to greatly expand our climate change efforts by considering all technologies that can help us in this regard. Denying the Citizens’ Assembly the opportunity to make an informed choice about the low-carbon options identified by the IPCC is wrong and is an early indication of our likely failure to begin, let alone to lead in, tackling the causes of climate change. We know who is paying the piper – but, as a nation, we can hardly be expected to call for a tune that we know little or nothing about! Good article again Denis. Political inertia will come at quite a price it seems. Have you seen the articles on Brest OD 300 ? Under construction at commercial scale at Seversk. The grass isn’t growing under their feet. Thanks, Brendan. I hadn’t paid too much attention to the Brest reactor once construction started, so good to be reminded of it. It looks interesting, even if it might be a difficult sell in the EU. Another useful one is the Pebble Bed due to be commissioned in the next 6 months at Shidaowan in China. But will our powers that be allow the people to hear about such low carbon technology? Not on your nelly, it seems! Previous Previous post: Same thing; different results?